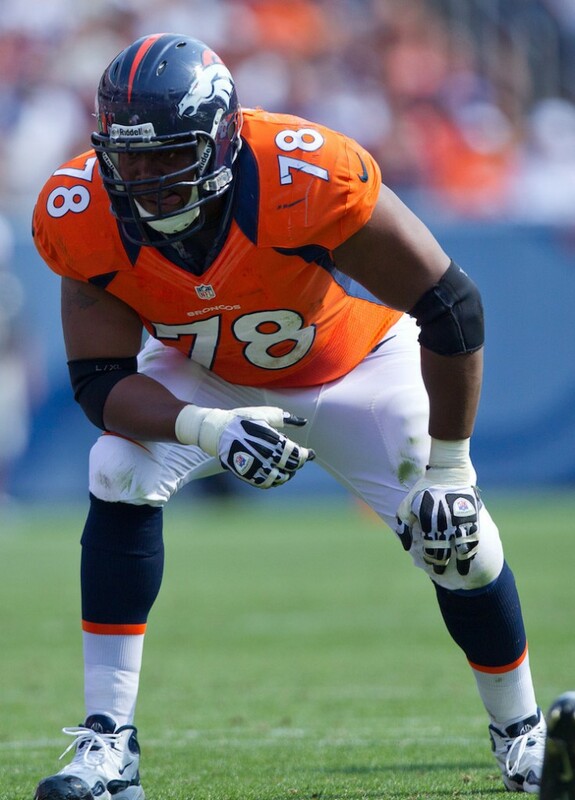 NFL: How Can the Denver Broncos Replace Ryan Clady? Anything short of a Super Bowl title will be a disappointment for the Denver Broncos in 2015. Such is life when you have an offense led by Peyton Manning and have a defense equipped with All-Pro caliber players all over the field. On Thursday morning, the Broncos’ road to Super Bowl 50 just got a whole lot bumpier. That was when it was announced that three-time All-Pro left tackle Ryan Clady suffered a torn left ACL during a non-contact drill during the Broncos’ Organized Team Activity (OTA) session on Wednesday. Before Clady’s (likely) season-ending injury, the biggest question mark for the Broncos heading into the 2015 season was their offensive line. With yesterday’s devastating news, Denver will now going to be attempting to make a Super Bowl run without the most talented offensive lineman on their roster. To make matters worse, the Broncos now have a glaring hole at the position tasked with protecting the blindside of Manning, who has never been mistaken for being a dual-threat quarterback. The good news for the Broncos is that even though their 39-year-old quarterback may be fairly immobile, he has proven time and time again throughout his 17-year Hall of Fame career that he can neutralize nearly any pass rush in the league with his quick release, his pre-snap reads, and his excellent decision making. Manning’s abilities will almost surely make the Broncos’ adjustment period from having an All-Pro at left tackle to an unknown commodity noticeably easier. But at the same time, it would be incredibly naïve of anybody to think that the Denver offense will make a seamless transition into life without Ryan Clady. So, where do the Broncos go from here? They basically have three options. The first option for the Broncos in their search for a new left tackle would be to stay in-house. The team has a couple of young, highly-regarded offensive tackles on the roster that will likely get the first crack at winning the starting left tackle spot. Michael Schofield, a third round pick in the 2014 NFL Draft, and Ty Sambrailo a second round in the 2015 NFL Draft have both been filling in at left tackle since Clady went down. Based on their college careers, Sambrailo, who played left tackle at Colorado State, is the more likely of the two to earn the starting job during the offseason. One player that seems to be forgotten in the discussion is 2013 starting left tackle, Chris Clark. As of now, the team appears to be set on leaving Clark at right tackle, but if Sambrailo and Schofield struggle, don’t be surprised to see Clark go back to the left side. The Broncos next option would be to scour the thin free agent market for help at offensive tackle. As it turns out, it didn’t take long for the Broncos to address the position through free agency. They have already signed nine-year veteran Ryan Harris, who actually entered the NFL as a draft pick of the Broncos back in 2007. Harris has been a solid player in the NFL, but he his skillset is a better fit for a role at right tackle. 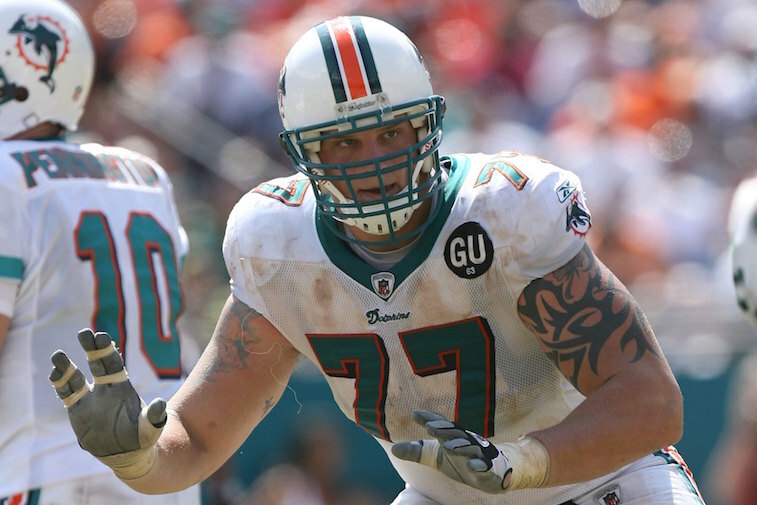 One veteran player to keep an eye on is Jake Long (pictured above). The No. 1 overall pick in the 2008 NFL Draft has proven that he can play at an All-Pro level, but has struggled mightily to stay healthy in recent seasons. According to recent reports, Long is healthy and looking for a team for the 2015 season, which means he is likely at the top of the Broncos’ free agency wish list. The last option for the Broncos would be to test the trade market. We view this as the least likely route for Denver, as the price they would have to pay in a trade may be more than they are willing to spend. Only time will tell how the Broncos choose to replace All-Pro offensive tackle Ryan Clady. At this point, though, their options appear to be either rolling the dice with what they’ve got, or making a push to sign a free agent player such as Jake Long. Either way, it’s safe to say that resolving this situation is something that the Broncos will not take lightly.